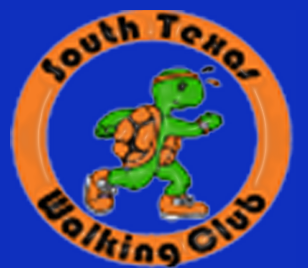 National Champions Our South Texas Walking Club Turtles had been the top race walking Junior Olympic team in the U.S. for many years but the Illinois Sharks came to the Junior Olympic National Championship in Jacksonville Florida ready to claim that honor. The Sharks brought nine of their team members to the JO’s. The Turtles began the year with seventeen but dismissed four of their members during the year and another four could not afford the trip and thus started the trip with the same number as did the Sharks, nine. Unfortunately for the Turtles, the parents of two of their nine athletes had auto problems on the way to Jacksonville and never made it to the stadium. The odds were now in favor of the Sharks. The Turtles took an early ten point lead on the first day with Emely Antuna and Johan Espinosa taking 4th and 2nd place respectively while Shark member Betsy Rodriguez took 7th place in the 13-14 year age bracket. The Turtle lead was short lived as the Sharks 9-10 year olds Heather and Hannah Durrant crossed their finish line in 4th and 6th place respectively for ten points giving the teams a new start at 12 points each. The Sharks then went on and finished the first day with an eight point lead as 9-10 year olds Frida Quiñones and Brisa De La Torre added nine points with their 3rd & 6th place finish, out pacing Turtle member Carolina Hernandez who finished in 8th place. The second day started with Turtle 15-16 year old member Julisa Juarez earning one point with her 8th place finish bringing the Sharks lead down to seven points. Turtle club member Amberly Melendez and Shark club member Nayeli Cisneros started off the next race together in their 17-18 year age group but Amberly soon took off after the predicted winner, Ashleigh Resch of Ohio. Amberly walked a superb race finishing in 2nd place in a personal best time of 14:58 while Nayeli finished in 3rd place reducing the Sharks lead down to six points. The Sharks were now confident of winning the championship as their top 15-16 year old Angelo Peters stood at the starting line on the next race. Vince Peters, our former national race walk chairman, had predicted that he would win this race but did give Eddy and Jonathan of the Turtle team an outside chance of an upset. This race turned out to be one of the most contested races of the day as the lead exchanged several times from Jordan Crawford (of Georgia) to Angelo, to Eddy, to Jonathan and finally to Jordan again. Jordan led most of the time and as Angelo tried to once again take the lead he fell prey to the judges 200 meters from the finish line as he was pulled out for, reportedly, a bent knee infraction. Jordan went on to win, but most importantly, Jonathan and Eddy finishing in 2nd and 3rd place respectively for thirteen points giving the Turtles yet another national championship. 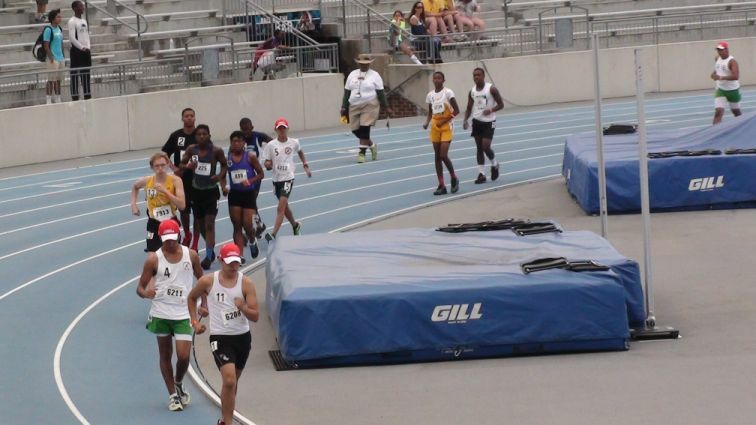 We thought that our USATF Junior Olympic Competition had been tough, having won it by only seven points, but we never dreamed of what awaited for us in Norfolk Virginia at the AAU Junior Olympic Championship. From the reception we received, it is now apparent that our combined efforts to promote race walking at the grass roots level is beginning to pay off. We were elated when we found out there were over one hundred teams with race walkers in attendance and surprisingly, it seemed as thou everyone and their grandmother came to participate. Newport News Virginia and Fort Meade Maryland had brought the greatest number of race walkers with ten and eight respectively. We, on the other hand, had fourteen athletes that had qualified after having dismissed four members during the year. Of the fourteen qualifiers, four could not make the trip, two got stranded on the road with their parents, one never left Pharr due to personal problems and Johan, our USATF Junior Olympic silver medalist, left for Europe immediately after said race, leaving us with only six members to defend our national championship title. Fort Meade got a jump start on the first day as the young team placed seven of their eight team members on the starting line and they all medaled for a total of forty three points. Newport News also placed seven of their ten team members on the line the first day and managed to earn thirty-one points. Carolina Hernandez (11) of the South Texas Walking Club felt overwhelmed without her other teammates in attendance. She, however, gave our club a boast as she provided us the only eight points of the day with her gold medal. The second day started just as bad for the South Texas Walking Club as Newport News 14 year olds Jayla Riddick and Diamond Sellers took 4th place in their respective walks. However, the turtles earned a gold medal from Emely Antuna (14) followed with a silver medal by Julisa Juarez (15) bringing the turtle’s score up to 23 compared to 41 for Newport News and 43 for Fort Meade. The tables turned after these races as Newport News and Fort Meade managed only one more athlete on the award stand while the turtles last two races were magnificent. The 15-16 year old boys race saw a repeat of the USATF three top finishers, Jordan of Georgia (15) and Jonathan (15) and Eduardo (16) of the turtle team. Jordan once again took the lead at the beginning of the race with Jonathan taking over at the end of the second lap. Eduardo rode their shirt tails just long enough to convince himself that he had had enough from the two fifteen year olds. He too soon went around Jordan and while it took him a little longer to go around Jonathan, he nevertheless picked up the pace around the 4th lap and Jonathan could not respond loosing the lead to Eduardo who never looked back. The boys reversed their finish line positions from their USATF meet, Eduardo finishing in a personal best time of 14:50.47, Jonathan in 15:06.90 and Jordan in 15:11.02. This brought the total points earned by the turtles to 38 compared to 45 each for Newport News and Fort Meade after Kenneth Valentine finished in 5th place for Newport News and Jose Alfonso Silva finished in 7th place for Fort Meade in the same race. There were only two more races left and neither Newport News nor Fort Meade had anyone to put on the starting line. This placed a lot of pressure on the only turtle, Amberly Melendez (17), left to race walk knowing that it would take a 1st place finish for the team to again win the championship title. Amberly took off at the sound of the gun but like every other turtle, she was well behind the leader at the end of the first lap. She had outpaced the 2013 record winning girl Brenda McCollum in 2014 with a time of 15:24.21, but could she stand the heat today. The National Weather Service heat index was at the extreme caution level as the race started at 3:30 p.m. However, she still felt ready and soon went around the leader covering her second lap in 1:56 causing her coach to ask her where the fire was since that was a little too fast and too early. Soon the announcer started reporting that Amberly had an opportunity of breaking the 2013 record of 15:11.04 as she started lapping many of her competitors. The audience started chanting “Go Amberly Go” which no doubt helped Amberly break the old record by seventeen seconds as she crossed the finish line in a time of 14:54.64, and, exhausted fell flat on her face. She soon got up and started providing water to her competitors as is customary for her when they cross the finish line not yet realizing that she had helped her team win another national championship title, even if it was by only one point. Here is the 2014 Application and the criteria for receiving a grant from NARI. “Coach Jaime, please provide me with the name and telephone number of Jonathan Aguilar’s parents,” wrote the North Carolina University head coach two years ago to Coach Jaime. He had just seen Jonathan participate and earn high school All-American honors at the New Balance High School One Mile National Championship in North Carolina and thought Jonathan was a high school senior. He was shocked to find out Jonathan, who is big for his age, was then only a sixth grader. Jonathan has continued to raise many an eyebrow since winning his first All-American High School race walk honor. He won the 13-14 year age bracket Junior Olympic National gold medals at the AAU and USATF Junior Olympic National Championships last year. He just now returned from Houston and Des Moines where he again won both National Junior Olympic gold medals this year. He is the fourth South Texas Walking Club member to ever win both Junior Olympic National Championships two years in a row. Jonathan has been walking at a faster pace than most other boys did at his age and he is now only an eighth grader at Alamo Middle School. His step father, USATF Association Race Walk official Juan Flores, is very proud of Jonathan and supports him in all his endeavors. Being supportive of other young walkers joining the team has always been a priority for Jonathan. He seldom misses any practice sessions and maintains good grades in school as mandated by the South Texas Walking Club Board. Jonathan has qualified to attend the prestigious USATF Texas Winter Race Walking December Camp being held in Pharr for the eighth consecutive year. He, along with team members Amberly Melendez, Matias Serna, Julisa Juarez, Gisela Flores, Emely Antuna and hopefully other members that will soon qualify, will be participating with other top elite race walkers including the USA team members that will be representing the USA at the upcoming USA-Canada meet, the Pan American Cup in Canada and the World Championship in China. The South Texas Walking Club is proud to have so many of its members qualify to attend this camp in Pharr headed by USA Olympian Tim Seaman and his wife, Canadian Olympian Rachael Seaman. Camp attendance is limited to the top forty elite USA junior & college girls & boys plus ten of the top elite junior race walkers south of the border for a total of fifty that will receive eight days of intensive training. 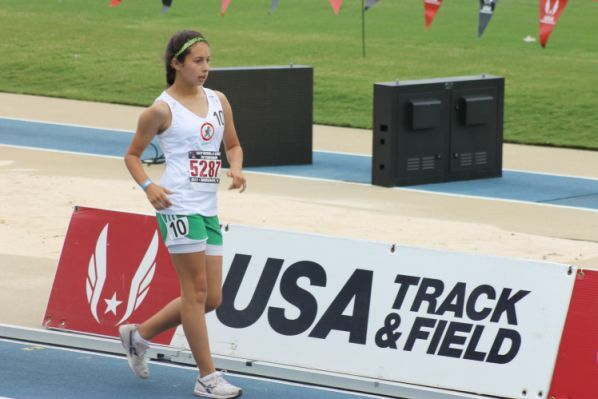 Julisa Juarez became a four time race walk champion at the AAU Junior Olympic National Championship held in Des Moines Iowa this year. The PSJA Liberty Middle School eighth grader had come back determined to win the gold medal once again but she knew it would not be and easy task. She and her team mates Gisela Flores, also of Liberty Middle School, and Itzel Gonzales of San Juan Middle School had dominated last years race when they finished 1st, 2nd and 3rd place respectively. Gisela and Itzel were to toe the line right along with Julisa and did not have any intensions of letting Julisa run away with the gold medal this year. Gisela and Itzel pushed themselves exchanging positions in 2nd & 3rd place but neither was ever able to go around Julisa who proved to strong for the girls. Gisela finished in 2nd place and Itzel came in 3rd just as they had the prior year well ahead of all other competitors. Julisa, besides being one of the top race walkers in the country in her age group, also excels academically. She has been in the top 10 percent of her class for the past three years and has perfect attendance. She has been commended on the Texas State exams and recognized by Duke University Talent I.D. program and the gifted and talented program extension. She furthermore has received numerous trophies in UIL. She has also been recognized in choir, theater and drama. Julisa has committed her summers since 2012 to South Texas College Prefreshman Engineering program and also volunteers at Saint Anne Catholic Church in the music ministry and lector (proclaimer) ministry. “I plan to continue with cross country, tennis orchestra and UIL in my freshman year but I will need God’s will, my parents’ support and Coach A.C. Jaime’s encouragement to fullfill my plan,” she said recently. She prays that her training in race walking and academic standing will gain her recognition to be offered a full scholarship to continue her education in a university as have other club members. Amberly Melendez, 16, a Junior at Thomas Jefferson EC High School, is an example of how an elite athlete approaches a high caliber race. She had the race of her life this summer at the AAU Junior Olympics in Des Moines, Iowa where she battled and won the national championship of her age bracket. Her story is one that shows that it's not how you start that defines you, but how you finish. Melendez, besides being ill from her stomach that morning was already facing other problems, physically and mentally, way before the sound of the gun. 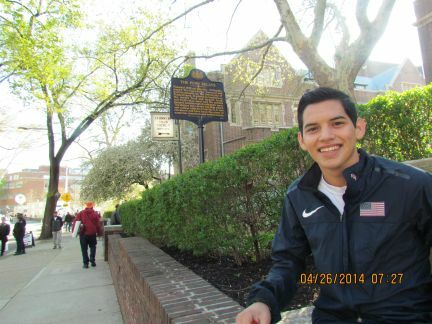 Before AAU, Melendez suffered a battle that athletes find difficult to beat, discouragement. Early that week she had competed at the USATF Junior Olympics in Houston and gotten fifth place. “I had never done worse than second at the Junior Olympics. I thought for sure I wasn’t going to win in Iowa,” reflected Melendez with relief as she now holds the gold medal. When asked how she overcame her discouragement she answered, "You have to believe in yourself and listen to your coach." "I reminded her that she had worked very hard. The work was done. All she had to do was believe in herself and her dream would come true," said A.C. Jaime, head coach of the South Texas Walking Club. With the upsetting fifth place under her belt there came another obstacle, Brenda McCollum, the national 17-18 AAU bracket record holder and returning champion. "I thought she was not beatable," said Melendez. She was wrong. The race started and within a kilometer she was already twenty seconds behind. While McCollum started at an unexpected blistering pace Melendez decided to play it smart and sit back at the pace she had been practicing all month. "Amberly intended to walk an average of 2:04 pace meanwhile Brenda opened up at a 1:45 pace," Jaime explained. "Brenda's quick start caught up to her as she slowed down by the third and fourth lap." Both girls met up by the end of the fourth lap. With three and a half laps left the real race had just started. Melendez’s plan was to hold the same pace, pass her, and not sit back and kick for the win. As she did, McCollum did not give in for the loss and fought. "She passed me again but I was not going to chase after her for the lead." Melendez had learned that sprinting back and forth for the lead can exhaust an athlete and prevent them from maximizing their performance. As planned, McCollum soon slowed down and Melendez took the lead and kept pushing like never before. With a tremendous negative split she passed the finish line with a time of 15:24, breaking her personal record and most importantly, winning the gold. When Coach Jaime was asked how Amberly Melendez showed such perfect performance he answered, "You have to go for it! When it comes to the point where you can't go more, keep pushing. You HAVE to pass that threshold to succeed." He paused for a moment reminiscing on such thought and with a smile finished his response, " and she did. She did it for the first time." For Melendez, it is not the gold medal that defines her but how she approached such goal. The young athlete, with two more years before she graduates, has already set a higher goal. "I want to train harder. I didn't train as hard as I would like to this year," Melendez modestly asserts. It is clearly shown that she is an athlete with no comfort zones and hungry for success. Next spring keep an eye on her as she practices for bigger races and bigger goals. She'll prove to you how strong of a finisher she is, inside and outside the track, by just watching her practice. The South Texas Walking Club gave the PSJA Southwest High School All-American, Geraldo Flores, their last cheers as they witnessed his last lap as a fighting turtle member in Des Moines, Iowa at the AAU Junior Olympics this summer. There is nothing better than graduating from a team with a high note like Flores did this year. Standing on the summit of the podium, where he was awarded his fifth national championship gold medal, he left a lesson to be learned by all South Texas Walking Club members. He battled against all odds after facing an unexpected obstacle and prevailed. Flores had suffered from an eye infection for over a month which impeded him from practicing the majority of the summer. Having skipped USA Junior Outdoor Championships and just qualifying for the AAU national championship Flores, along with the club’s head coach A.C. Jaime, had questions over the performance to be expected at nationals. During the summer his infection recovered and he was given two weeks to get in the best shape he could before departing to the Junior Olympics. For an athlete this situation would be like cramming for a test, they cannot expect the best from it. Having worked diligently, Flores soon arrived to Des Moines. Not being in the perfect conditions he wanted to be he carefully made a plan to maximize his performance. 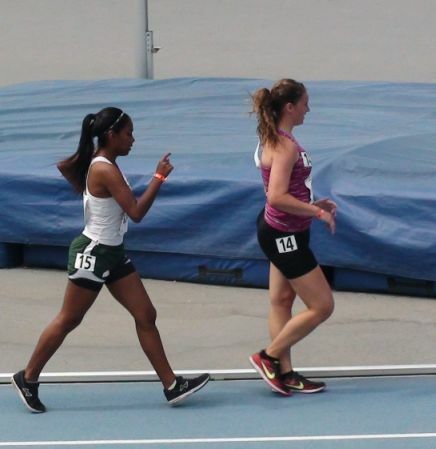 Before his race, teammate Amberly Melendez had just outpaced two time national champion and record holder Brenda McCollum of Kansas. Flores, being a returning champion, was afraid the same thing could happen to him, lose. What had happened to McCollum was the lack of consistent pacing throughout the race. Melendez, on the other side, did the opposite. Just how people learn, Flores observed the race and listened to McCollum’s and Melendez’s lap splits. When it was time for him to perform, the South Texas Walking Club veteran executed a controlled race for the win. He suffered, he recovered, he performed, and he won. Farewell races don’t always go beautifully as planned. In this case Flores had to cram and intuitively improvise to prepare for one of the most important races he has had. He shows signs of not just a great athlete but one with great potential for the future. Now, Flores is in preparation to be part of the Goshen University track and field team in Indiana on scholarship. He is leaving but he is not taking everything with him. He has left inspiration, experience, and leadership to his teammate Matias Serna, 16, of Thomas Jefferson EC High School. The young athlete looks very promising. Having placed 8th at USA Junior Outdoor Championship, 3rd at USATF Junior Olympics, and gold at AAU Junior Olympics this summer, Matias Serna has shown he is ready to take over. With three more years left before he graduates from high school, his goals are to one day represent the USA at an international event and become America’s high school champion. The best laid plans of mice and men oft go awry, and like many others before him, that is exactly what Matias Serna experienced at the AAU National Junior Olympic Racewalk Championship. The 16 year old PSJA Jefferson EC High School All-American freshman had previously won gold medals in each of the 12, 14 and the 15-16 year age brackets. He was now back with intensions of, not only repeating as the 15-16 year age bracket gold medalist, but intended to outpace his own teammate, 18 year old five time high school All-American Geraldo Flores, in the 17-18 year age bracket group. “Coach, may I go around Geraldo if he has any problems?” Matias reluctantly asked his coach, A.C. Jaime, a day before the race. He had just finished his USATF Junior Olympic National Championship race five days earlier in Houston with a time of 14:57.63. Just half a second behind Geraldo. He felt he had a good chance today, since Geraldo was still recovering from a severe eye infection. 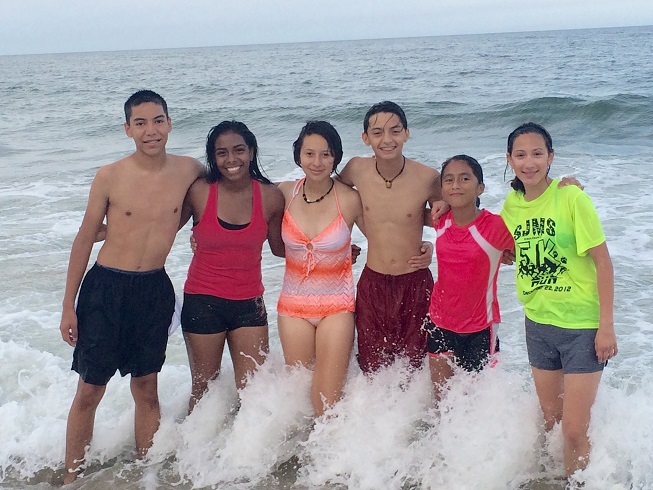 Unexpected things do happen and 16 year old Amberly Melendez, the boys teammate, did the unexpected that day. She outpaced the prior 17-18 year age bracket record holder. Brenda McCollough of Kansas, as the boys sat on the sideline waiting their turn to race. Both looked at each other and realized that the same could happen to them as they too were prior year gold medalists in their repective age brackets. Geraldo jumped ahead at the sound of the gun with Matias in hot pursuit. They went around the first lap in a time of 1:56 and repeated the same time on the second lap just as they had in practice all season long. The second unexpected moment of the day happened to Matias one hundred meters into his 3rd lap as he was a yard behind Geraldo. He fell to his knees after stepping on his own loose shoe lace, and recovered quickly only to fall again seconds later. Geraldo was 100 meters ahead by the time Matias corrected his problem. Worst of all, Matias other teammate, Eduardo Uria, had come shoulder to shoulder with him, challenging him for their age bracket gold medal. However, the rookie, while doing extremely well in the short time since joining the club, was no match to Matias as the seasoned racewalker soon recovered and came home with his fourth gold medal, as well as a bruised & scraped knee. 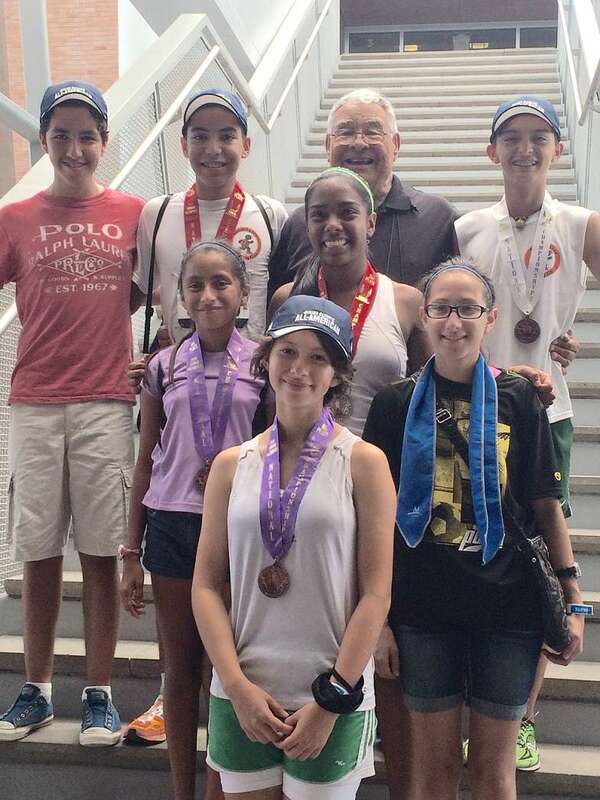 The South Texas Walking Club won its 14th USATF and 15th AAU consecutive national racewalking Junior Olympic Championships in Houston and Des Moines on July 22nd and 27th, respectively. There were fifty-eight clubs that competed at the USATF National Championship where the valley club earned a total of seventy points to win the championship. Second place was earned by the Elgin Sharks of Illinois, coached by USA top rated racewalking coach Diane Graham Henry of Chicago. The New Jersey Striders and the Miami Valley track clubs tied for 3rd place with twenty four points each. After a successful championship, the club then traveled 980 extra miles to Des Moines, Iowa where they won the National AAU Racewalking Championship with 92 points. Georgia, Missouri and Maryland earned 2nd, 3rd and 4th place with 70, 61, and 56 points each. The South Texas Walking Club is elated with the addition of three new members to their elite group of national gold medal winners. They are: Carolina Hernandez, 10, of PSJA Trevino Elementary who won her gold medal in Houston; Elijah Hernandez, 11, of PSJA Ford Elementary School and Emely Antuna, 13, of PSJA Liberty Middle School who both won their gold medals in Des Moines, Iowa. Club members winning their fourth national gold medals included PSJA Jefferson EC High School All- Americans, 17-yr-old sophomore Amberly Melendez and 16-yr-old freshman Matias Serna. Also winning her fourth national gold medal was 14-yr-old Julisa Juarez, an eighth grader from PSJA Liberty Middle School. PSJA Southwest High School five time high school All-American graduate Geraldo Flores earned his fifth national gold medal. 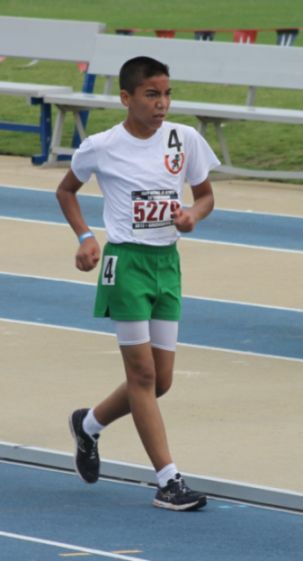 14-yr-old high school All-American Jonathan Aguilar, of PSJA Alamo Middle School, earned USATF and AUU gold medals for the second consecutive year bringing the total of national gold medals earned by the South Texas Walking Club to 93 during the past fifteen years, an average of 6.2 medals per year.